Bake about 20 minutes. Meanwhile, in small bowl, beat eggs and milk with whisk until smooth. Stir in salt and pepper; set aside. Prepare vegetables and herbs for filling. Press excess moisture from vegetables; place in large bowl. Add parsley and mint; toss. Arrange vegetable mixture in partially baked pie crust. Pour egg mixture over vegetables. Sprinkle evenly with crumbled cheese. Bake 30 to 35 minutes or until knife inserted in center comes out clean and center barely jiggles when quiche is moved. Remove from oven; cool at least 20 minutes before cutting and serving quiche. The options for quiche fillings are almost endless. 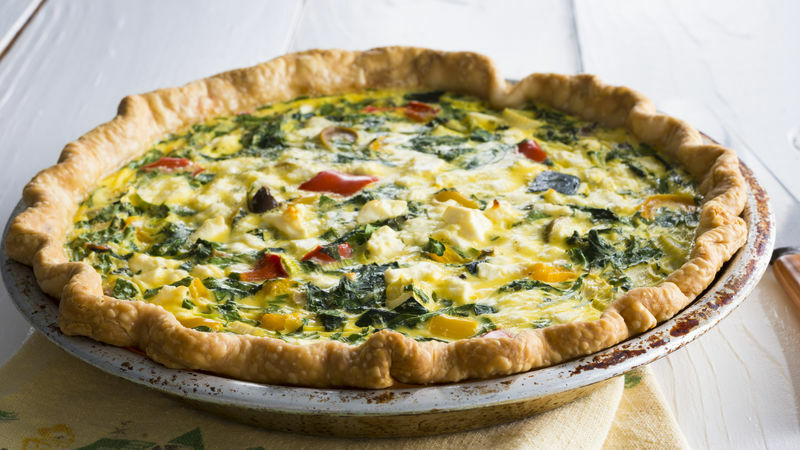 A basic guideline is that for a 9-inch quiche you’ll need about 1 1/2 to 2 cups of cooked vegetables. If you’re adding meat or cheese, use about 1/2 to 1 cup meat, such as cooked bacon or sausage, and 1/2 to 1 cup cheese. Use 1 cup cooked chorizo sausage, 1 cup roasted red bell peppers and tomatoes, 1/2 cup chopped fresh cilantro, 1/2 cup chopped green onions and 1 cup shredded pepper-Jack cheese. Use 1 cup cut-up smoked salmon, 1 1/2 cups cooked asparagus spears, 1/4 cup chopped fresh dill or chives and 1 cup cubed cream cheese. Use 1 1/2 cups cooked sliced mushrooms and 2 cups chopped fresh kale (roasted or steamed and excess moisture pressed out). Add 1 cup shredded Swiss cheese.